While in Boston, the club played their home games at the Boston Arena and Boston Garden. However game scheduling at Boston Garden owned by the rival NHL Bruins became increasingly difficult, and the owners decided to relocate the team to Hartford, Connecticut beginning with the 1974 – 1975 season. The area, aside from various minor league teams in New Haven, had been largely bereft of pro hockey until the team’s arrival. 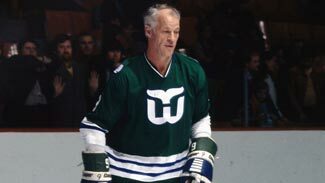 While waiting for their new arena in Hartford, the Whalers played the first part of the 1974 – 1975 season at The Big E Coliseum in West Springfield, MA.